It was this Twitter conversation with Pace University’s Center for Community Action and Research (CCAR) that started it all. The “Take Action! To End Human Trafficking Event” hosted by CCAR was the first petition event I semi-organized and actively participated in. I’m usually the person who signs petitions and talks to friends about it; and there was that one time in my freshman year I sat behind CCAR’s petition table and asked people to sign the petition to raise awareness on the illegal use of coltan (a mineral used in the production of electronics) in the Democratic Republic of Congo. I can’t remember how I felt about that experience since that was early into my first semester of freshman year. That experience must have had a positive impact, though, since I came back a year later to work with CCAR to make this event happen. 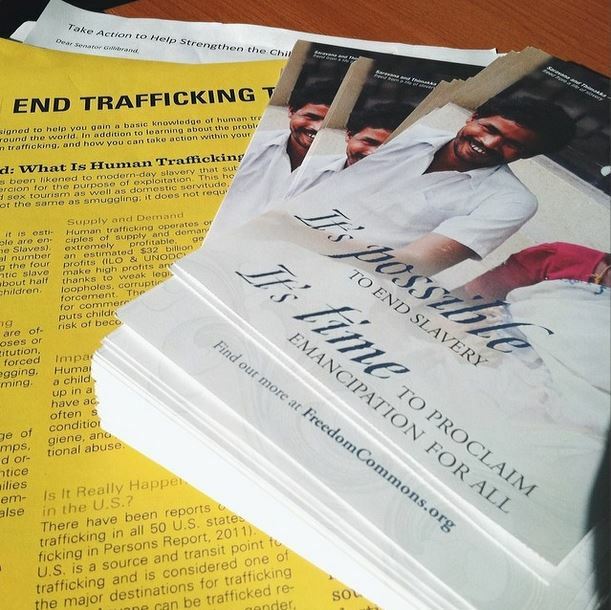 CCAR and I decided to use the International Justice Mission’s (IJM) “100 Postcard Challenge” as the petition, since each postcard asks Congress to be accountable in making efforts to end human trafficking in the USA and other nations. Additional petition sheets were made and addressed to Senator Gillibrand; those were titled “Take Action to Help Strengthen Child Welfare Response to Trafficking.” That second petition specifically asked Senator Gillibrand to cosponsor the relevant bipartisan version of the “Strengthening Child Welfare Response to Trafficking Act of 2013” (H.R. 1732 and S. 1823), as many state and local agencies need to improve their ability to protect children from trafficking and exploitation. On a positive note, I remember excitement in having three friends sign up to table the event; two of them went to the library and cafeteria to ask people to sign the petition, while my other friend manned the table with CCAR. I covered the front lobby, the honors lounge, and school hallways (starting from the second floor all the way to the sixth floor), talking to people who were loitering and eating lunch. Since this was my first time going up to people and asking them to sign the petition, I was extremely nervous the first few times and embarrassingly stumbled upon my words. But after talking to people after a few minutes, the words came out easier and I was more fired up than ever to not get shut down. One of the many responsibilities as an activist is to advocate for causes in a way that doesn’t demonize people or insult their intelligence. The issue also has to be presented in a way that is relatable to people for them to make connections to their personal life. That is one of the hardest things you have to do as an activist, especially if you were not personally affected by the issue. It has me question my role as an activist and wonder if there is any validity to what I am advocating for. After all, “The privilege of continued visibility and having a voice is immense, but also tyrannical as you get older. Embrace responsibility with wisdom. Don’t be a dinosaur who won’t shut up.” (“Some lessons about activism.”) My friends and I walked into this event not knowing what to expect since this was our first time doing active petition work; we just approached this thinking “What happens, happens.” We were fueled by our passion for anti-trafficking initiatives and excitement in having this event come to life. I found it interesting that my two friends who asked people in the library and cafeteria didn’t meet so much resistance as I did while I walked around the front lobby and school hallways; though of course, the library and cafeteria environments foster a more dynamic “academic” group setting compared to the school hallways and front lobby. I don’t think there is a quick way to measure the impact petitions have on enforcing policy changes, since it usually takes awhile to accumulate the number of petitions required to get the government’s attention. But petitions are a great way to bring attention to issues that are otherwise ignored or stay under researched. Of course, one can’t help but wonder if the person who signed the petition will remain interested in pursuing the issue. I think that the success of a petition event stems from the amount of people power put into it, especially the proactive measures taken to ensure a large amount of acquired signatures. If my friends and I had not approached people, we would not have gotten our total result of 150 signatures – and while that may seem small in quantity, that is actually the highest number of signatures CCAR received for a petition event. I feel as if I’ve been through some “right of passage” or “initiation” having participated in my first petition event for anti-trafficking measures, and I’m excited to do similar events in the future. CCAR’s Take Action! 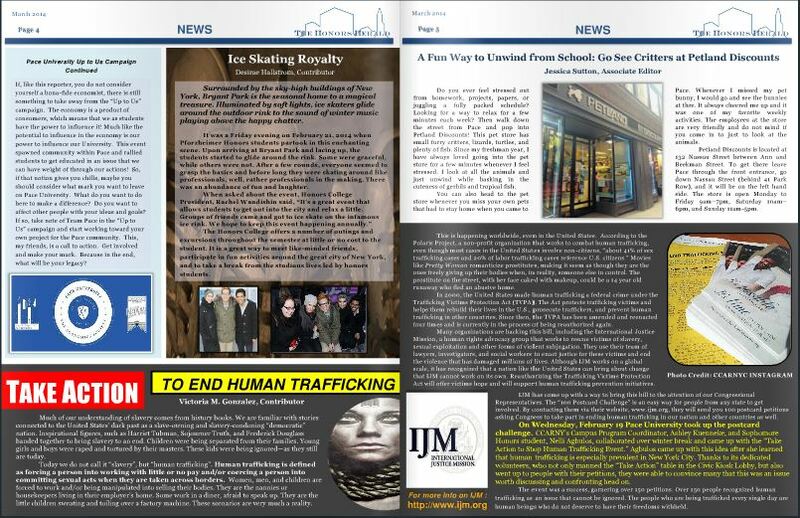 To End Human Trafficking Event was covered in the March 2014 issue of Pace University’s Pforzheimer Honors College newsletter. The article was written by petition volunteer Victoria Gonzalez, and it can be accessed here on pages 4 and 5. “Some lessons about activism.” Oil is Opium. N.p., n.d. Web. 2 May 2014.